The heart has four valves – the aortic, mitral, tricuspid and pulmonary valves. Like valves used in house plumbing, the heart valves open to allow fluid (blood) to be pumped forward, and they close to prevent fluid from flowing backward. Human heart valves are flaps of tissue called leaflets or cusps. Regurgitation – The valve doesn't close properly. It leaks, sometimes causing a significant backflow of blood. 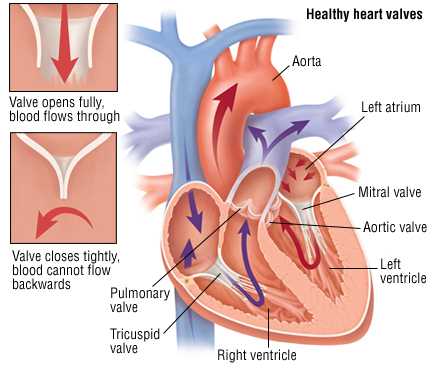 Heart valve problems can be congenital, which means present at birth, or acquired after birth. A heart valve problem is classified as congenital when some factor during fetal development causes the valve to form abnormally. Congenital heart valve disease affects about 1 in 1,000 newborns. Most of these infants have stenosis of either the pulmonary or the aortic valve.